Open Studio Weekend is a rare opportunity to get a glimpse of Corban Estate Arts Centre’s artists in action! 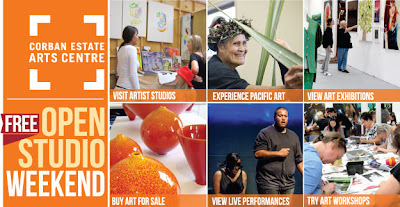 With more than twenty open onsite artists’ studios, contemporary art exhibitions, dynamic performing arts groups, Pacific arts and culture, a brand new Coffee Studio café, a gallery shop and much more, Corban Estate Arts Centre has become a hub for the thriving arts in West Auckland. DO, TASTE, TRY, VIEW & ENJOY THE ARTS! Come and see how established and emerging artists work in their studios. View a showcase of contemporary artists’ works at the art galleries in the Homestead and various art exhibitions including our popular Neighbourhood. Get a taste of Maori contemporary dance by the increasingly edgy Atamira Dance Company; a performance of the emotionally charged Blood in Water by Phoenix Performing Arts and experience a further injection of youth energy with Fresh Movement, a newly established street dance collective. Teenage film director brothers, Chris and Robbie Peters (ages 17 and 15), will present their strong and sensitive short film, The Contender. Mixit performers, including young refugees, migrants and locals will present a film. Performances over the weekend will be followed by a Q & A with the artists. Experience the traditional arts and crafts from the Pacifica Mamas at the must-see Pacifica Arts Centre; and create unique artworks in the free drop-in, hands-on workshops over the weekend. Watch internationally renowned TMD (The Most Dedicated) crew update the graffiti wall at the outdoor spaces of the Estate. Indulge yourself at our brand new Coffee Studio café over your favourite beverage and taste delicious home baked muffins, pies, sandwiches, salads, biscuits and cakes. The menu also includes brunch from 10am – 2pm. Browse in the gallery shop with its hand-crafted art for sale or purchase original art pieces from the artists. All this and much more only at Open Studio Weekend!